1. I'm pretty sure the acrid taste of the breading was due to the fact that the teens behind the counter would rather smoke marijuana cigarettes than clean the fryer grease, but there's a slight possibility that this whole sauce thing might be Wendy's trying to hide the fact that they're using low(er) quality chicken. 2. The sauce, while not as brown as what you get at the Chinese food carts, had the same corn starchy consistency and stickiness that you pray won't leap from the container onto your hands or clothes (especially if you've got your swag on). 3. More on the sauce: the spice catches up to you, the sweetness makes your teeth hurt, and the red pepper flakes are made of tissue paper. 4. Fries and Sweet & Spicy Asian Chicken is a terrible combination. Sprite doesn't help the cause. 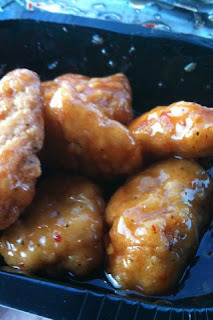 If you've ever put sweet & sour sauce on your chicken nuggets, then these boneless wings are nothing new. The processed chicken is molded a bit differently to replicate breast meat, but that's about it. In addition to the flavors of the Far East, Wendy's also offers Bold Buffalo and Honey BBQ, two flavors that, sadly, I'll be stupid enough to try in the coming weeks. Buen provecho.